Karimeen or Pearlspot is a tasty fish we get in Kerala. ‘Karimeen Pollichathu’ has become world famous! 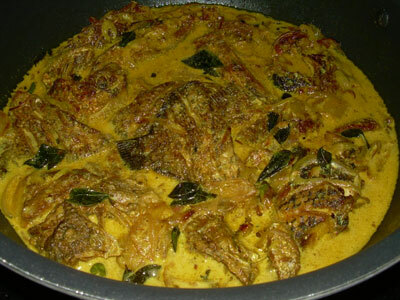 ‘Karimeen Varuthu Palu Curry’ is a dish made often in Christian homes in Kerala. In this recipe, first the fish is fried lightly and then cooked in a coconut milk gravy. It is a very tasty curry and goes well with rice, bread, appam, idiyappam, puttu or dosa! If Pearlspot is not available, you can replace it with Pomfret, Seer fish or Tilapia. In a vessel, mix together chilli powder, turmeric powder, pepper powder, vinegar and salt. Smear this paste on the fish pieces and keep aside for half an hour. Fry them in oil till light brown in color. Keep aside. Heat oil in a large pan, fry onions, ginger, garlic, green chillies and curry leaves till the onion tuns light brown in color. Add coriander powder, turmeric powder and pepper power. Fry for few seconds and add thin coconut milk, vinegar and salt. Cover and cook till it boils. Now add the fried pieces of fish. Pour some gravy over the top of the fish pieces, cover and let it simmer for about 10 minutes on low flame. Open the lid and add the thick coconut milk. Mix gently or twist the pan. When it is about to boil, put off the flame. Serve hot. Note : you can use the coconut milk or coconut milk powder available in stores. To make thin coconut milk, dilute it with water. This is my entry for the event Think Spice….Think Ginger being hosted by dear Sunita of Sunita’s World. Did you hear that weeping. That is me because i want to have your karimeen curry but you are not giving me. It just look super super delicious. Now a whole heap of plain rice and i can start enjoying. I am drooling in your picture . This looks so good. I would have to substitute karimeen though. Lissie lovely dish!! 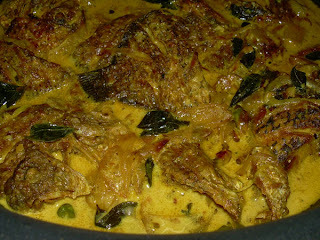 I remember having this fish at one of my kerala friend, never tried but its looks delicious!!! OMG! that looks super delicious. Never had this before but the pic is tempting me. Thanks for sharing the recipe. looks gr8, but nvr heard of anything like that. will try to do it some ime. Of all the things that can be curried, I love fish curry the best. Your description and photograph has me drooling. OMG, are you out there to torture me with Karimeen, my FAVORITE fish in the world! It looks great Lissie! That’s a lovely recipe and something new for me to try…thanks Lissie for sending it over. asha, very good idea! thanks a lot!! padmaja, you should have enjoyed it at your friend’s place! paati, fish moly is yet another Kerala delicay 🙂 this curry is different. thanks for visiting! oh my ! soooooo yummy.. i am drooling !! Looks so tasty! I wouldn’t mind having that tonight for dinner. sig, come over and you can have as much as you want! rachel, it goes well with bread! sunita and remya, try this recipe. you will love it! thanks pravs, kelly, bharathy and seena for your good comments! I made this curry and was super-duper. Made with whole tilapia..don’t get karimeen here. Very tasty !